Thomas Jorgensen leads the way for Panthers against Berwick. Panthers have sealed their place in the SGB Championship play-offs – but team boss Carl Johnson insists the hard work is just getting started. Their top-four place was then sealed on Tuesday night when Edinburgh were beaten at Glasgow in a Scottish derby. Table-topping Panthers have enjoyed a fine campaign despite suffering a host of injury problems which have continued in recent days with the loss of number one Scott Nicholls and reserve Tom Bacon. 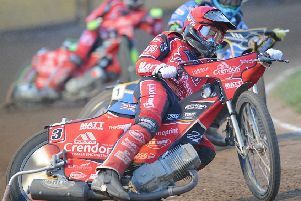 While seven-time British champion Nicholls hasn’t given up hope of recovering from a broken ankle to play some part in the club’s chase for honours, Bacon’s campaign is over after he suffered a fracture of the back. Heat leader Ulrich Ostergaard and second-string Emil Grondal have also missed chunks of 2018 through injury while original team member Nike Lunna was lost to a broken ankle. “It’s fantastic to be assured of a play-off place after all the work the lads have put in,” said Johnson. “Every single member of the team has contributed well to a really enjoyable season, but reaching the play-offs is only half the job. “We’re now getting to the business end of the season. League titles aren’t won in April or June or August, it’s what happens in the next few weeks that really matters. “Losing two matchwinners in Scott and Tom at this stage of the season is really cruel and we’ve had to deal with a lot of injuries this season. “Ulrich is the only one of them who was actually hurt riding for us. Otherwise it’s been people getting injured guesting or with other clubs. “But we all know that crashes and injuries are part of the sport and we just have to hope we can steer clear of any more of them. Panthers lead the way from Glasgow and Workington by five points and nailing top spot is the priority in their two remaining league meetings. They go to Workington tomorrow (Friday, 7.30pm) before facing Lakeside at the Hammers’ new Rye House base on Saturday. That clash forms part of a double-header as Lakeside also take on Newcastle at 7pm. Panthers are expected to be on track around 8.30pm. Johnson added: “We’ve gone into every away meeting this season with the aim of picking up at least a point – and that’s not going to change. “If we manage to get that at Workington and Lakeside, I’m sure it will be enough to ensure we finish top and that would be a great way to end the regular season. Panthers have turned to Redcar man Ben Barker to step in at number one for both meetings and also use his Bears team-mate Jordan Stewart again at reserve for Bacon. Captain Simon Lambert misses both fixtures due to his Saturday wedding. He is replaced in the other reserve berth by Ipswich man Coty Garcia at Workington and Newcastle veteran Carl Wilkinson against Lakeside. PANTHERS (at Workington): Ben Barker (guest), Emil Grondal, Bradley Wilson-Dean, Michael Palm Toft, Ulrich Ostergaard, Jordan Stewart (guest), Coty Garcia (guest). PANTHERS (at Lakeside): Ben Barker (guest), Emil Grondal, Bradley Wilson-Dean, Michael Palm Toft, Ulrich Ostergaard, Jordan Stewart (guest), Carl Wilkinson (guest). Panthers then face Lakeside in four cup clashes later this month. They meet twice on Sunday, September 23 in a KO Cup quarter-final (away leg at Rye House, 2pm, followed by 7pm home leg at Alwalton) before doing battle again the following weekend in the SGB Championship Shield semi-finals. The away leg of that tie is on Saturday, September 29 (7pm) ahead of a Sunday, September return return at the East of England Arena (5pm).